Individually wrap the butternut squash in foil and bake them in the oven for around 50 minutes (depending on the size) or until soft. Set aside and allow to cool down. While the butternut squash are cooling, start to make the filling. Gently fry the onion in the oil for 5 minutes, then add all the other ingredients for the filling and simmer for 15 minutes. Season to taste. Once finished, set aside. Once the squash are cool, cut them in half and scoop out the seeds along with a little of the flesh. 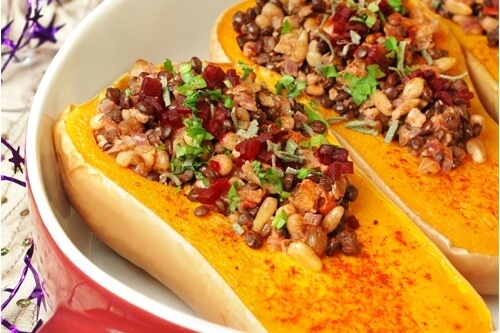 Add the filling mixture to the squash and bake for a further 10 minutes. To serve: garnish with beetroot, herbs and paprika.